I was out walking yesterday and noticed a group of people looking at something on the ground. As they walked off, I looked down to see what it was. It was an empty cigarette packet with a rather unusual image on it. Oh dear......I initially thought it was a Halloween leftover but it turned out to be one of the new compulsory plain packaging cigarette packets. In order to sell cigarettes in Australia tobacco companies now have to use plain packaging. The packs are matte olive green in colour, have no obvious logos and carry large pictures of the physical damage caused by smoking. The packs only show death and disease and are designed to reduce their appeal to people and hopefully reduce smoking related deaths. The world's big tobacco companies fought the Australian Government on this but they lost the legal battle in our highest court a couple of months ago. It is a first in the world, so other countries may follow suit. Can you imagine this happening in your country? It is only a matter of time before they put the same on McDonald's packaging too I guess. I am not a smoker so I won't have to look at these packets on a daily basis but the images are definitely confronting and horrific. It may stop young people taking it up I hope. I was on the train over the weekend and happened to notice this sign. 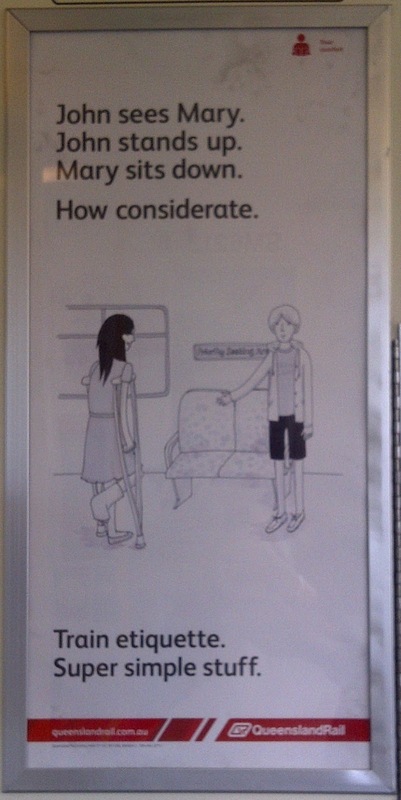 Seriously, how sad is it that we have to tell people to offer a seat to someone who has their leg in plaster and is walking on crutches.......and even sadder that it is written like a 1st grade reader. Do you have police that are responsible for crime in your area? We do and they seem proud to advertise the fact. Read this sign closely (thanks to a friend in Sydney who sent me this). I don't think the police intended to say this exactly. Not sure it is politically correct to have a sign that says, Give way to Peds, do you? And don't forget to come back and visit on Wednesday as the 12 Days of Giveaway starts - a little giveaway each day for 12 days and open to International readers too. Something for everyone. Christmas comes early on Lilly's Life. So join in please, especially my regular readers. You have well and truly earnt your entries. Wow, I guess everything has to be spelled out. Not sure if I have told you that this is oceangirl. Hello Lilly. The tobacco cases are startling and gross. Sometimes you really do have to spell things out some people just really are clueless. Have a wonderful weekend! 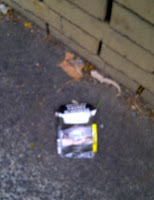 Those cigarette packs are terrible but hopefully will turn kids off smoking. I don't think smokers who are addicted will care though. It is pretty radical and your government should be applauded. Wouldn't happen in the UK. Ha ha, the police are responsible for crime hey, bit of a mistake that is lol. 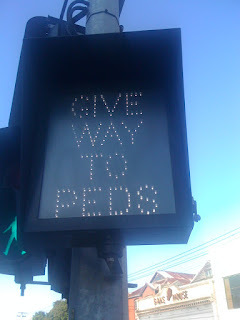 As for give way to peadophiles (sp?) have you read about the horrific case about Jimmy S here and how the BBC just let him get away with it. Terrible stories coming out. Yes I have read about it and I think this sign applies to the BBC. They had to know what he was up to. I had no idea the tobacco companies in your (beautiful) part of the world had been forced into these dire warnings. The truth is the warnings are accurate, and if just one person stops smoking or if kids never take it up, it will have done good. Here in Oregon, it is the law that motor vehicles stop for pedestrians ... no matter where or when ... as they cross a street. Doesn't apply to major highways of course, though in Bend we don't have too many of them. It's both a good law and a bad law: when a car stops suddenly to let someone cross the street, the cars behind that car don't always get the message and BANG there is a rear end crash .. or a series of them. Happy Monday to you... me, I'm having a happy Sunday!!! wow Helen how fascinating about the giveway rules - so people can cross the street anywhere not just at marked crossings? That is incredible. You relaly would need to keep your eye on the road at all times in case someone just ran in front of your car. And thank you, I have had the best Monday ever! 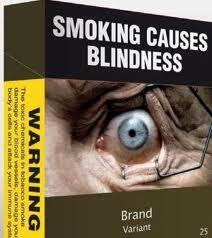 smoking causes blindness? Luckily I don't smoke but McDonald's warnings would get to me, lol. Very graphic signs all around, it's sad that it has come to this. You know the women will sooner give up their seats than a man would, I've noticed. Yes, it causes lots of health issues we never really hear about. 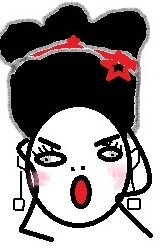 I am surprised too. I don't eat McDonalds but there would be a few other questionable food choices that I am guilty of. And yes, I agree, it is the women that tend to give up their seats. Not sure why that is really. I do n't think we are any politer but perhaps we empathise more or something. Wooow, it is so sad that people have to be told to give up their seat for a mother or elderly person. Common sense, not everyone has it. True Brigitte, manners have gone by the wayside I guess. Really annoying. The cigarette pictures freaked me out! I'm glad I don't smoke and that Greg doesn't either. One of my friends is trying to quit, she's using the "electric cigarette"... hopefully she'll stay with it. The police one had me laughing. Yes I am glad you both don't smoke too especially with dear little Gregory on the way. One less thing you have to worry about and it is so expensive too. I think it is FANTASTIC that your beautiful country has passed these Laws about smoking. And NO, I can never see it happening here in the USA...The Tobacco Lobby is TOO BIG and TOO POWERFUL here....And that is more than sad---It Is Truly Criminal. Having been a very heavy smoker, back before we knew it was Sooo Horrific on your Health, (Though we should have known...) I stopped smoking 42 years ago. 4-2 YEARS! And, as I said, I was a very heavy smoker. FOUR Packs a day! I know----it doesn't seem possible---But, It Was! I applaud your wonderful country for passing laws that SHOW the effects of what smoking can do to your Health, Right On The Package! I am always amazed at all the signage required to help all of us "think". I agree how ridiculous is it that we would need signs to prompt an able bodied person to give their seat up to a person that is injured. 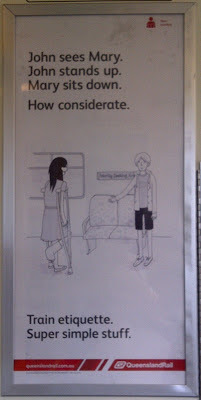 How much can we bet that the person that is rude enough not to give up their seat isn't reading the sign. As for the cigarette packaging rules...I am not a smoker but part of me considers that unfair to the cigarette manufacturers. We don't put pics of liver cirrhosis on advertising for alcohol or pictures of melenomas on bottles of sun tan lotion. People ultimately know that things are unhealthy or can be harmful in not used appropriately. It is an interesting issue Cheryl isn't it - where do you draw the line and how far can governments interfere in what essentially is someone's personal buying choice. I think the issue is that most governments are not going to be able to afford the healthcare costs for those whose lives are affected by smoking. this is particularly so given the aging population and the increased health costs assoicated with these people (us). Also it is the teenagers who get addicted to smoking (and who the tobacco companies target) and they are very influenced by the packaging, because it is so cool - I was definitely like that as a teenager. Gullible - I may not have been if I had seen graphic images such as those. although I am very surprised how graphic they are but I guess they are genuine images from real live case. The cigarette packages look gross, but I too hope it will turn kids off smoking. My Dad died from emphysema; it was a long, slow, painful death that I wish on no one. We gave my Dad lots of love and kisses during his illness, and he was taken care of at a wonderful nursing home. Take care, Lilly. Oh I am sorry about that Beth it must have been very hard to watch. I feel sorry for all those people who got hooked as young kids before the damage was ever known. Wow, those are some graphic warnings. But necessary since people just don't seem to get it on their own. I think the difference between cigarette labels and labels for suntan lotion or alcohol is that cigarettes are the only product designed to kill you if used as the manufacturers intend. I had one grandfather die from emphysema and one from lung cancer - both smoked heavily up until they went on oxygen. The police label is funny, and even though that's not what they meant, there are police officers who do criminal acts, so they aren't entirely off!. That is a great comment Secret Agent Woman - the only product designed to kill you as manufactureres intend - excellent argument as to why the same should not apply to other vices. The big tobacco companies are global are they not? So there is no reason why it can't be done anywhere in the world. I think this is fabulous. . Yes they are global Anton. Governments across the World are all fighting the same ones. Those packets are scary but both my parents died from cigarette smoking so this needs to be done. It is different from alcohol because cigarettes kill even if used in moderation. Junk food and alcohol can be used in moderation. Yes true Banoffi cigarettes are just lethal, nothing good about them. Maybe the government should go after the big pharma companies next. Smoking kills and there is no other outcome. Now that would b something, they just have us by the throat these big companies. In New York state we have some very graphic anti smoking ads. I don't have television so it's been since 2009 since I've been exposed on a daily basis...but they were memorable enough to stick in my head all this time. That is interesting. It is just a matter of time then Bedford it moves to the Packs. Good on you for being without a TV. You must achieve so much more in your life. That is interesting Kathy. I know it is before a court in New Zealand at the moment too. Imagine the millions that are being spent in legal fees. However, I guess it is costing governments millions in healthcare and the tobacco companies have millions to lose in sales. Even though tobacco companies are heavily taxed its not enough to offset the cost to society for the damage it does. It will be interesting to see what happens in the US as it is such a big market. omg I can't even look at that image. Horrific and I am a smoker. Most smokers don't want to smoke but it's a horrible addiction. I am going to keep trying and just a note to everyone, the Australian Government fought the World's mega Tobacco companies at the highest courts on this issue. Therefore there Is no excuse for any government in any country to fight them. They are making billions in profit by killing people. It is wrong to equate the tobacco industry with the fast food or alcohol industries. I don,t think Aussies have given enough kudos to the Gillard Govermen for doing this. Well keep trying Tracey, you will do it. And I agree it is a remarkable achievement really, just fantastic. The police poster is a real hoot! Shame it was not designed to be hilarious - they kind of noticed it had a double meaning after it was put out in public. Amazing approach to the cigarette problem. How long has this been in place? If it works then other countries should follow your lead. Police sign is funny but unfortunately there are a few bad cops everywhere. It is an amazing approach Bill. It started in September and by December of this year all cigarettes will have the plain packaging. So it is just new legislation after a big legal fight with the massive global tobacco corporatations. They fought it all the way as they have a lot to lose. It is a remarkable achievement really. Although I just read that one big tobacco company put a new slogan on its cigarette packs, which says, "It is what is on the inside that counts." They are bastards they really are. Anything to keep people hooked. I understand how addictive it is and how hard it is for people to give up. I dont believe many smokers want to smoke by choice after a while. Don't they say it is worse than having a cocaine addiction? Anyway, there is nothing stopping other countries from following suit now at all as we all are fighting the same tobacco companies the world over. I know that New Zealand are following now too and having the same legal fight with the tobacco giants. I hope they lose everywhere. There is at least a precedent now. "on the inside that counts" - should be your insides will cough. What's inside is bad health. I did smoke for 15+ years. My wife made me quit and it's a great thing that I did. Well done to you and thank goodness for your wife. That is a great accomplishment. I really want my sister-in-law to stop smoking, but I have a feeling even that kind of packaging won't stop her addiction. Turns me off though. My son did work for an anti-smoking campaign a few years ago. I wonder what he would think. I'd love to know if this works to cut smoking in Australia. That's pretty funny about the police crime sign. Sheesh! How embarrassing! I can't look at the packets but I wonder if similar images were on my favourite packet of sweets whether I would still be put off. Addictions are something else but they may turn young kids from smoking. Good on Jon for doing that work. I just looked for a place to comment on today's post and couldn't find it. I could just be blind. It's possible. I wanted to tell you that I'm really keeping all my fingers and toes crossed tomorrow and hope that your predictions are correct. I was so devastated when Bush won the last time. I LOVE your YouTube and have sent it on to my children. I Kay, you are not going blind as I turned the comments off just for that post. Yes it is funny and a good laugh for everyone. you guys must be sick of the election coverage by now! On your post above, Obama better win. Billions have been spent for one purpose and one purpose only: to obscure and distract from the fact that Mitt Romney is backing the identical agenda George W Bush did. It's really and truly that simple. Oh my that police one is hilarious. I bet they were disappointed it made them look like idiots.